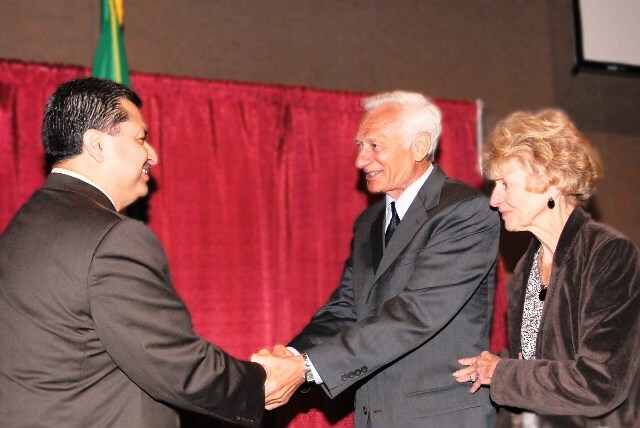 Richland entrepreneur George Garlick was named as the 2007 Tri-Citian of the Year on Saturday. “All I can say is wow, I’m just overwhelmed,” Garlick said, upon receiving the honor. He was introduced by Frank Armijo, the 2006 winner. The recognition was announced at the annual award banquet at the Three Rivers Convention Center in Kennewick before a crowd of more than 400 people. The Tri-Citian of the Year award is sponsored by the Rotary clubs of the Tri-Cities, with the winners chosen each year by an independent committee. Earlier this year, the Richland Rotary also awarded Garlick its 2007 Sam Volpentest Entrepreneurial Leadership Award. Garlick did pass out briefly before the program started, requiring assistance from paramedics. He said he was all right and that it was something that has happened in the past and was due to pushing himself too much. He made headlines recently for his philanthropy, giving $50,000 in February to support WSU Tri-Cities’ first freshman class and following it up with March’s $300,000 unrestricted donation to The Chaplaincy at Hospice in the Tri-Cities to honor a former employee who had died of cancer. However, Garlick’s “service above self,” in the Tri-Cities goes back four decades and even earlier, to when he was growing up on a Nebraska farm during World War II. He worked two jobs while attending college, determined to find ways to provide for himself and his family while also remaining committed to his Christian faith. It was also, Garlick said, where he learned four lessons from his father that have guided him through life. Those were to never criticize another person; be the first to apologize regardless who is at fault; never defend yourself if people say false things about you; and always think of the interest of others first. Garlick’s father, who never graduated eighth grade, taught his son those lessons, as well the value of getting an education while he also went blind from cataracts and, as a result, had to take a $1 a day job in town as a janitor. Garlick got that education, eventually earning his doctorate in electrical engineering. He remembers the story, he said, of how after graduating he was flown first class to California, where he was met by a limo and offered a great job. In contrast, he was flown economy class to the Tri-Cities, landed in the middle of a sand storm and there was no car waiting for him. And he said the Tri-Cities has met every expectation he has ever had since. He helped develop and direct during the 1960s the Joint Center for Graduate Study — now Washington State University’s Tri-Cities branch campus. It was during that time he also developed the acoustical holography technology that Advanced Imaging Technologies — of which he is founder and chairman of the board — is putting to work in early breast cancer detection. He’s started more than a dozen companies, and his Tri-City Science and Technology Park in north Richland was recently recognized as one of the top 10 research parks in the country. He is the president of Garlick Enterprises; founder of the Gloria Meek Garlick Foundation; president of the Steven Center Properties and manager of the Smart Park Properties. Others submitting letters in support of Garlick’s nomination were a who’s who of the Tri-Cities, including letters from past Tri-Citians of the Year Fran Forgette, Bob Lampson, Armijo, and Sandy Matheson. “His quiet but enduring service to the community has helped create better lives for everyone he touches,” Matheson said.